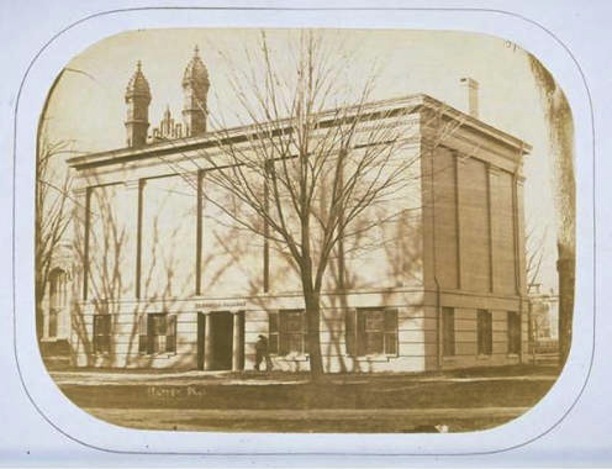 On October 25, 1832, the Trumbull Gallery at Yale opened to the public. Also known as the Picture Gallery, the Trumbull Gallery holds the distinction of being the first art museum at an educational institution in the United States. Benjamin Silliman, Yale’s first Professor of Science, began discussions of a gift with John Trumbull in the summer of 1830. At the time the walls of the 75-year-old Trumbull’s lower Manhattan apartment were full of paintings depicting scenes from the American Revolution but Trumbull was becoming increasingly short of funds. The paintings included everything from The Battle of Bunker’s Hill to miniature portraits of persons distinguished during the Revolutionary War including Oliver Ellsworth and John Adams. Trumbull agreed to give his best works to Yale in exchange for a lifetime annuity of $1,000 a year and the construction of a fire-proof building to be designed by Trumbull himself. The Neoclassical building ended up housing more than 50 of Trumbull’s paintings, several of which were painted and given to the Gallery after the signing of the original agreement. John Trumbull and his paintings traveled aboard a steamboat to New Haven on September 27, 1832, so that Trumbull could personally direct the hanging of his works. When Trumbull’s wife Sarah died in 1834, Trumbull had her body interred beneath the Gallery and Trumbull himself was buried there in 1843. When Yale opened its new gallery in 1869 and then the present Yale Art Gallery in 1928, the Trumbulls’ remains were reinterred so that John might lie beneath his pictures. “Yale University Art Gallery,” n.d. Link. “John Trumbull - Collection.” Yale University Art Gallery - ecatalogue, 2014. Link. Trumbull, John. “Chapter XXI - Age, 72 to 85 - 1828 to 1840 - 12 Years.” In Autobiography, Reminiscences and Letters of John Trumbull, from 1756 to 1841. New York & London; New Haven: Wiley and Putnam; B.L. Hamlen, 1841. Link. Cooper, Helen A., ed. John Trumbull: The Hand and Spirit of a Painter. New Haven, CT: Yale University Art Gallery, 1982. Sizer, Theodore. The Works of Colonel John Trumbull, Artist of the American Revolution. New Haven, CT: Yale University Press, 1967.